This is a guest post by Sheryl from Off She Went. 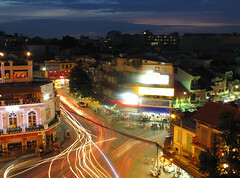 Hanoi at night, by gphayter. Traveling in Asia is a must for many backpackers around the world. The allure of experiencing other cultures, exploring the unknown and meeting new people along the way adds on to the excitement of the trip. Throw in the low cost of living there (particularly in South East Asia); one can get by on less than $15 a day. This is certainly a huge reason travelers try to visit as many Asian countries as possible. In S.E.A, no trip is complete without a mandatory stop in Vietnam. Whether you make it your first stop or last, this charming country is a gem in its own right and visitors can take up to a month to fully explore its vast offering. However, if you find yourself strapped for time and only have a day in Hanoi, the capital of Vietnam, fret not. Here is a one day itinerary recommending the best picks for you to experience in this enchanting state. The Old Quarter is where most tourists stay as the majority of accommodation can be found there. From backpacker style hostels to more upscale hotels, there is a place for everyone. Start your day early by heading out and ordering some steaming hot beef pho for breakfast. After that, walk to the nearby Thang Long Theatre to purchase tickets for the water puppet show at night. Do it early as most tour companies tend to snap up the tickets in bulk for their customers. Digest your breakfast by crossing the road to take a stroll at the iconic Hoan Kiem Lake where the locals love to hang out at. Smack in the middle of the lake is the turtle tower where many photo enthusiasts love to snap pictures. Many groups of people gather there for recreational activities such as playing chess, jogging, chatting idly or simply to watch the world go by. After that, head on down to the Historical Military Museum and Hanoi Flag Tower to learn about history of the Vietnam War and see some war time relics. Pay a visit to the Hỏa Lò Prison, better known as the Hanoi Hilton which was sarcastically named by American prisoners of war and take an educational tour on the history and gruesome conditions the prisoners had to endure during that era. After walking for some time, a nice lunch is in order. A popular café to get some grub is the Trung Nguyen Café which is located near the Hoan Kiem Lake. After having your fill, continue exploring the city by walking to the Ho Chi Minh Mausoleum where the body of Ho Chi Minh lies. In the vicinity, take some time to visit the One Pillar Pagoda, The Presidential Palace and Ho Chi Minh Museum. While it is impossible to visit all the museums and temples in the area, these are the ones not to be missed. Hang Hanh Street (Coffee Street) is the place to go for some afternoon snacks and drinks. Caffeine addicts will be ecstatic at the vast number of cafes serving aromatic coffee all day long. Settle down with a steaming hot cuppa and a slice of cake and watch the world go by or enjoy some quiet time reading a book. Shopping is terrific in Hanoi; the Dong Xuan Market is a popular choice among the locals shop owners for wholesale buys and is worth a visit to witness the hustle and bustle. However, the Old Quarter’s many streets offer a much wider and more fashionable range of goods to buy. Here, one can tailor make a suit or dress made of the finest Vietnamese Silk, buy wooden handmade crafts, woven bags; and enameled and acrylic house décor. Save time and money by having your dinner on the go. Purchase some street food and sit on small plastic stools at one of the many road side stalls that seem to spring up out of nowhere. Enterprising owners also sell thirst quenching lime juice as it can get hot and sticky just by walking through the bazaar. Don’t forget to watch the one hour water puppet show that you purchased in the morning. After that, go to Hang Dao Street which is closed off to traffic and turned into a lively night market eagerly visited by tourists and locals alike. If you did too much shopping, go back to the hotel to put your stash first before heading on to the pub street where you can get some good old beer for less than a buck. Sit on stools lined in the alleyway and people-watch. Sheryl Goh is an avid traveler and loves to pen her thoughts on good old paper while exploring new places. At the same time, she has a passion for health and fitness and runs a blog called Off She Went where she dished out tips on health, wellness, nutrition and travel.